Transportation and Parking Services makes campus life easier by administering transportation and parking programs at the University of Florida. Transportation and Parking Services works closely with Student Government and the Regional Transit System (RTS) to provide convenient, fare-free public transportation on campus and to and from many locations within Gainesville. Your Gator 1 ID card makes campus life easier by granting fare-free access to RTS bus service. All students may ride any RTS bus anywhere in Gainesville including campus, fare-free, by simply presenting their valid Gator 1 ID card to the driver. Students who wish to park a vehicle on campus must purchase a parking decal and park in an appropriate area. Campus parking is limited and most students find that it is not practical to use their car for campus transportation. Not to worry. 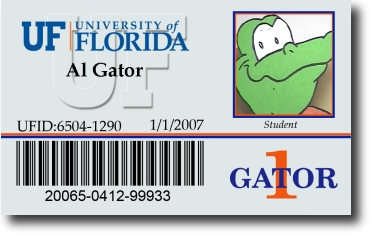 With your Gator 1 ID card and RTS, you don't have to. Complete information about UF's transportation and parking programs can be found online at www.parking.ufl.edu. New students are encouraged to browse the FAQ of the web site for a brief introduction to transportation and parking at UF. If you want to learn more about RTS bus service, please visit www.go-rts.com. For further information, please contact Transportation & Parking Services via phone at (352) 392-7275 (PARK), Monday - Friday 8:00 am - 5:00 pm, via e-mail at gator1central@bsd.ufl.edu, or visit our website at www.parking.ufl.edu. This page was last updated on 4/21/2011.